Arf Arf is an ensemble of artists, sound poets, filmmakers from Melbourne Australia. Marcus Bergner, one of the initiators, lived for some years in Europe and was more than once guest of Suburban video lounge with screenings and performances. The group of four: Marcus Bergner, Marisa Stirpe, Frank Lovace and Michael Buckley, is now touring through Europe with old and new works. 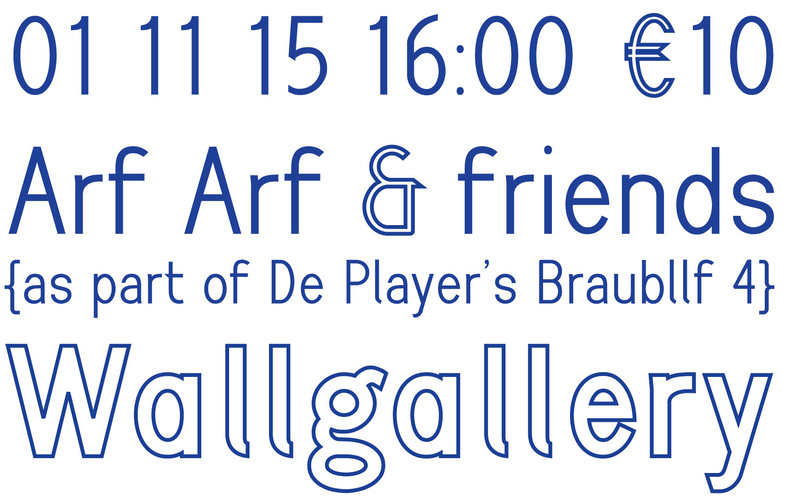 Next to their participation in the Brussels and Rotterdam editions of De Player’s Braublff 4, this Sunday performance in Wallgallery will be fully dedicated to the Arf Arf songs, polyphonic sound poems which have been developed by the group over many years and are still being brought to life by means of their very basic scores. In the home/ gallery of Michel and Han, a large square table will be installed around which the 4 Arf Arf members together with 8 guest performers and 28 visitors will be randomly seated. In line with the group’s open mindedness – other performers and interpretations are always welcome – each of the invited guest-performers choose a score in order to develop a totally new version of the song, solo or multi-voiced. Guest performers: Mariëtte Groot / Florian Cramer, G.J. Derook, Myriam van Imschoot, Kathrin Wolkowicz, Vanita and Joe Monk, Peter Fengler, Inge Hoonte and Toine Horvers. This entry was posted on 15/10/2015 at 08:50 and is filed under Uncategorized. You can follow any responses to this entry through the RSS 2.0 feed. You can leave a response, or trackback from your own site.